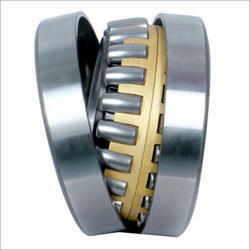 Spherical bearings have a capacity to carry high loads tolerate shocks loads, and are self aligning. As they can tolerate limited speeds, spherical bearings are used in vibrators, shakers, conveyors, speed reducers, transmissions, and other heavy machinery. Spherical ball bearings are made in varying radial thickness and axial widths to accommodate different loads. Spherical plain bearings can accommodate a shaft or rod with varying misalignment. They consist of a plain bearing, with a ball bushing, inside a cylindrical housing. The housing may have a liner of different material to minimize friction or provide self-lubrication. Many ball and liner materials are available with different ratings for load capacity and lubrication requirements. Typical design attributes may include large bores, spherical rollers accommodate heavy radial loads while permitting axial loading and relative misalignment between the housing and the shaft. More contact area, inner rings to resist cracking, allowance for static or dynamic misalignment, and expansion capabilities are other features. Looking for Spherical Roller Bearing ?